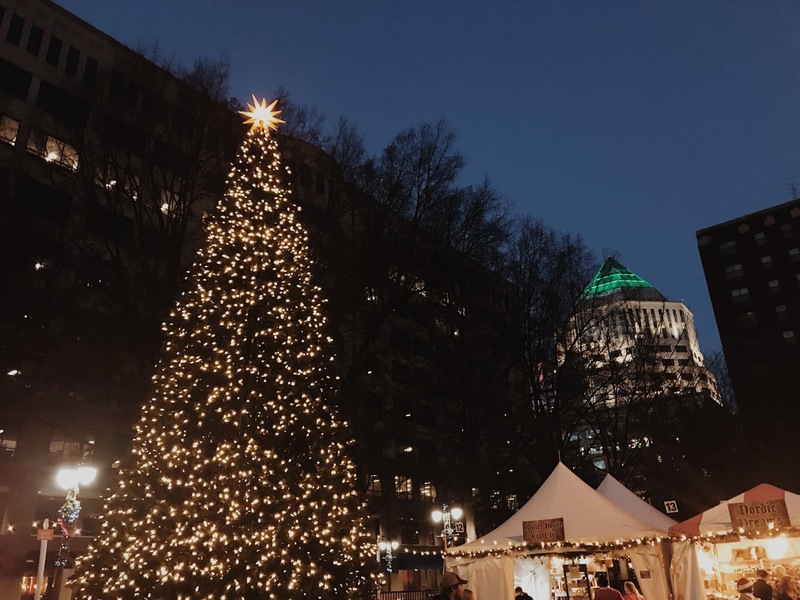 a visit to the german christmas markets. - crafted fragments. 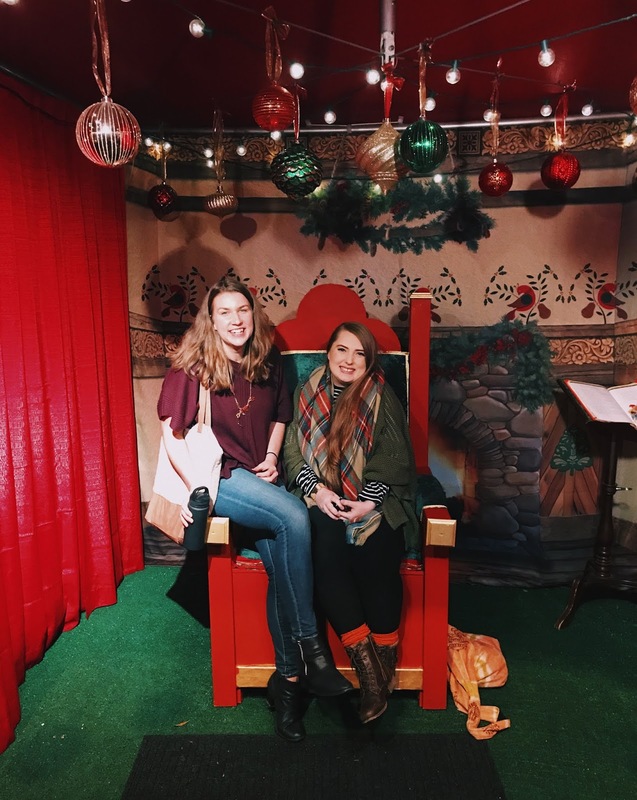 during the holidays, sus visited a genuine german christmas market, which is a magical holiday street market, originating in germany, with delicious food, scrumptious drinks (mulled wine anyone? ), & an array of seasonal crafts, all in open-air stalls surrounded by music & wonder. sounds too good to be true, right? well, as my husband & i were planning a trip to her hometown this past weekend, i decided to look up & see what fun & festive things we could get up to. & what did i find? 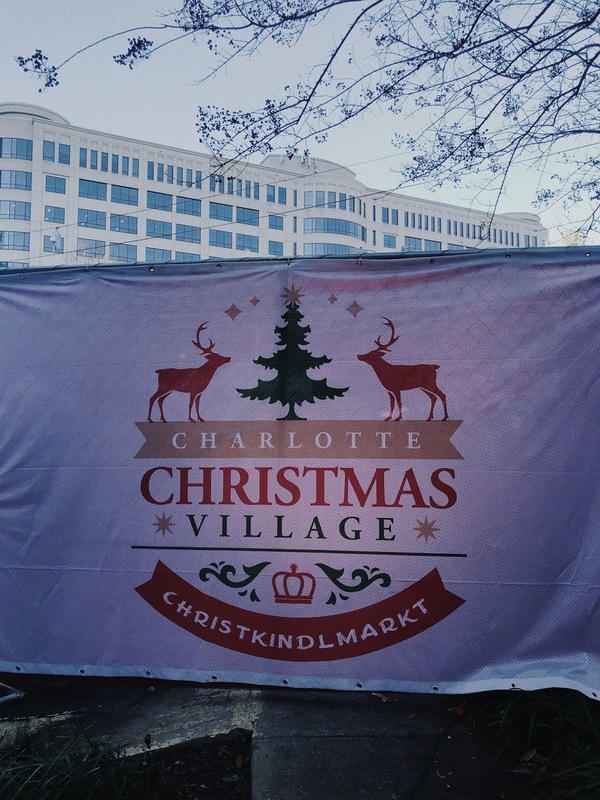 the charlotte christmas village: a north carolinian attempt at a real life christkindlmarkt! (say that five times fast, i dare you). i, of course, immediately texted her that this was a must. for so many reasons. firstly, i would finally get to experience a tiny taste of the magic she experienced first hand! i knew it would be awfully americanized, but it was still worth it. i mean, i saw online that there would be strudel. i needed to know what strudel tasted like. & what's more, i happen to be a quarter german. & that quarter happens to be just about the only part of my heritage i know anything about! i grew up extremely close to my maternal grandmother. she taught me all about her family's traditions, & even tried teaching me a little bit of german! unfortunately, all i remember is how to say apple, which is apfel, which is the easiest word to remember... my grandma now has advanced alzheimer's, so any connection to my german heritage helps me feel closer to her. 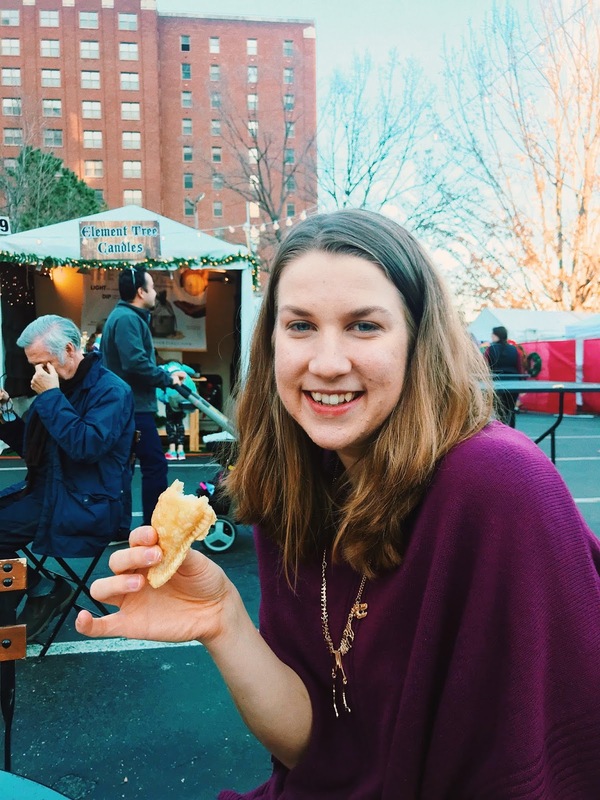 i was so thankful to find this christkindlmarkt! 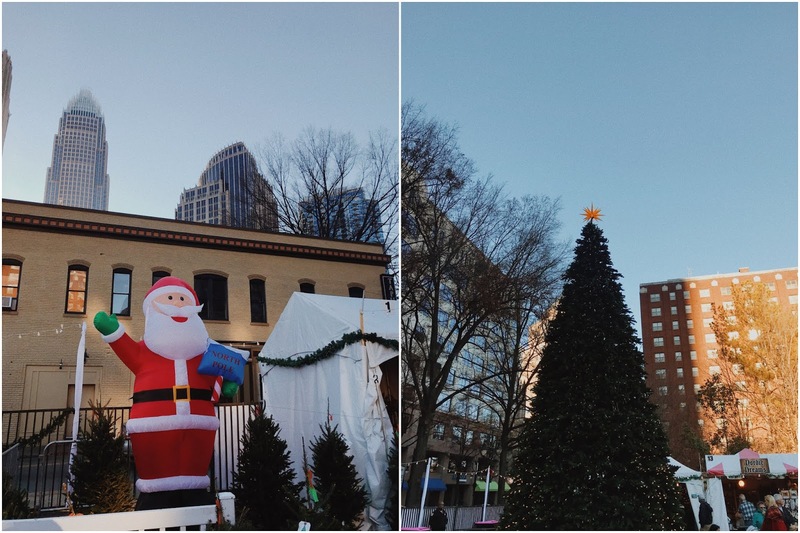 nestled amongst the downtown skyline was a gorgeous christmas tree & a quaint attempt at a german christmas market. 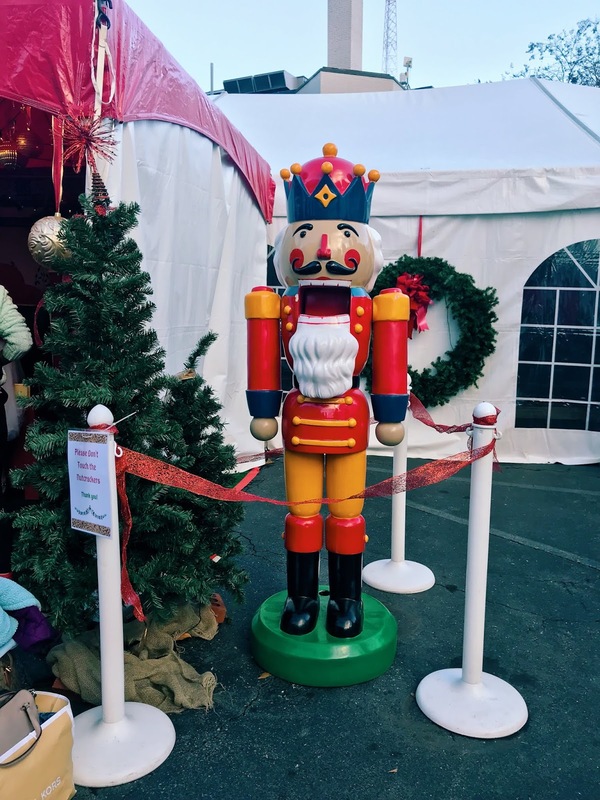 yes, there were blow up santas & highly overpriced vendors... but there were also a few choice nuggets of german craftsmanship & culture for us to find. the entire market smelled of cinnamon & spice, wafting from the "kool fun nut shack" (real choice name). a sweet little man wandered around, playing christmas carols on his accordion for the market-goers. there was a variety of ukrainian hand-blown, hand-painted glass ornaments at "hans & heidi's holiday haus", & a collection of scandinavian gnomes at the "nordic dreams" tent (my personal favorite). while we didn't try the bratwurst or the sauerkraut, we couldn't resist trying the perogies. 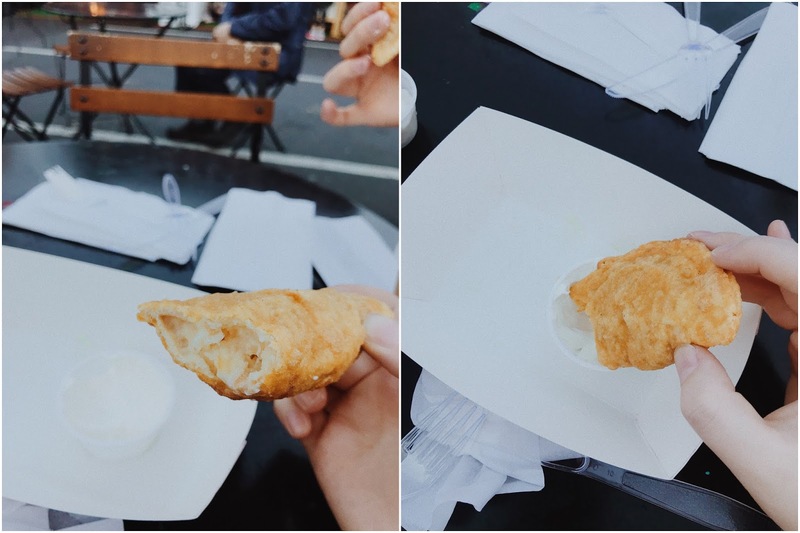 when i asked what a perogie was, the lady said & i quote, "it's basically mashed potatoes with onions & cheese, fried in dough", to which i said, "um yes & please & thank you". i mean, if that isn't just the exact list of all my favorite foods??? potatoes, onions, cheese, bread, PLUS you dip them in sour cream. literal heaven on earth. you can't not smile when holding such a golden delicacy. 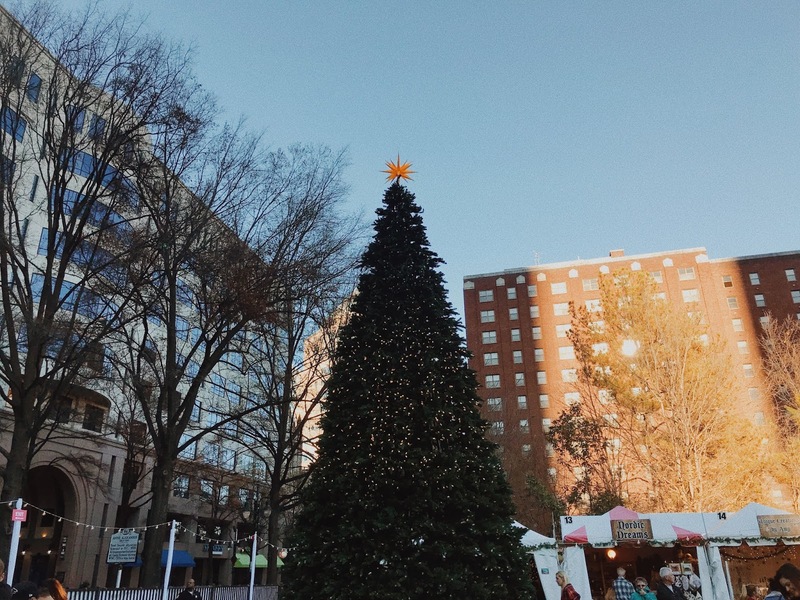 we continued to explore the various vendors, tucked amongst the cutest christmas decor. 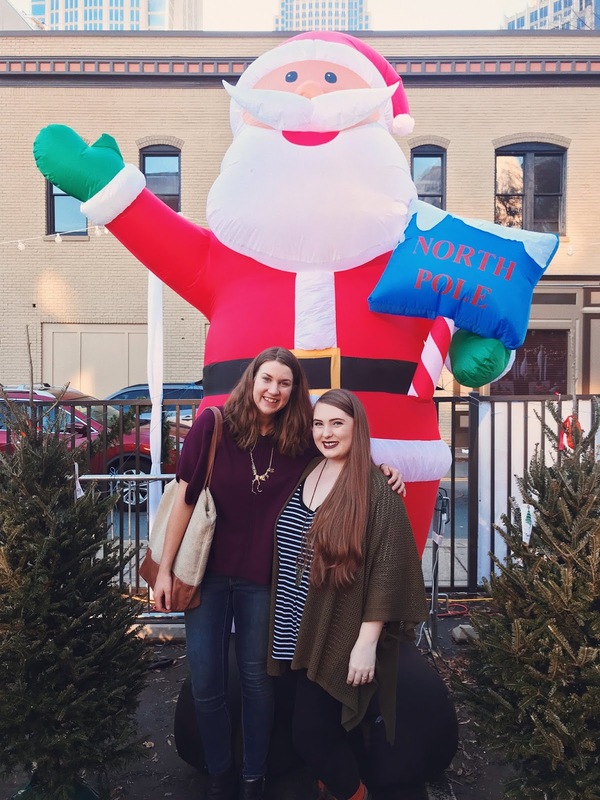 we saw moonshine fudge, ecuadorian jewelry, moravian stars, bacon jam, austrian egg ornaments, & lots of puppies (it was heavenly). when stopping at the fudge vendor, we definitely took advantage of the free samples & tasted flavors from buttered rum to fireball to creme brûlée! 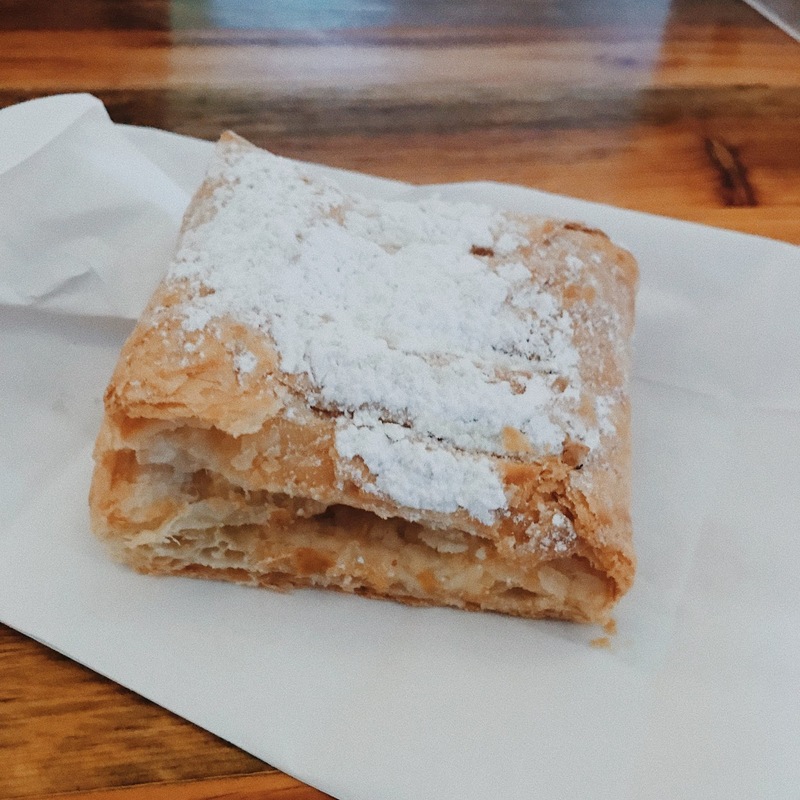 & next on the list of things to try was the strudel. flaky, buttery, cheesy, & sugary. need i say more? now, as we explored the markets, i kept talking to susanna about one particular thing. 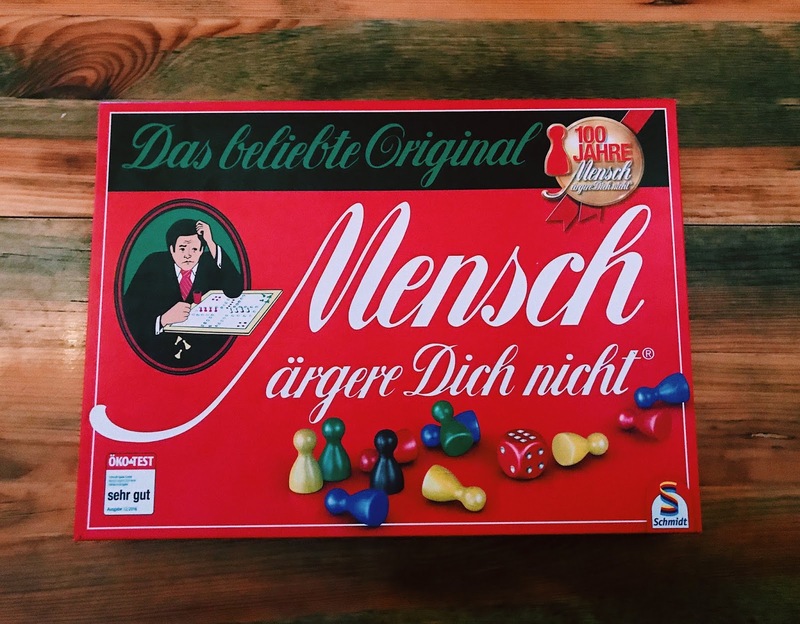 growing up, an honorary grandmother of ours used to play this board game with me called mensch ärgere Dich nicht. she was the sweetest old german lady, but the moment she would whip that game out, it was no more mr. nice guy. the name of the game translates to something like, "don't get mad, man! 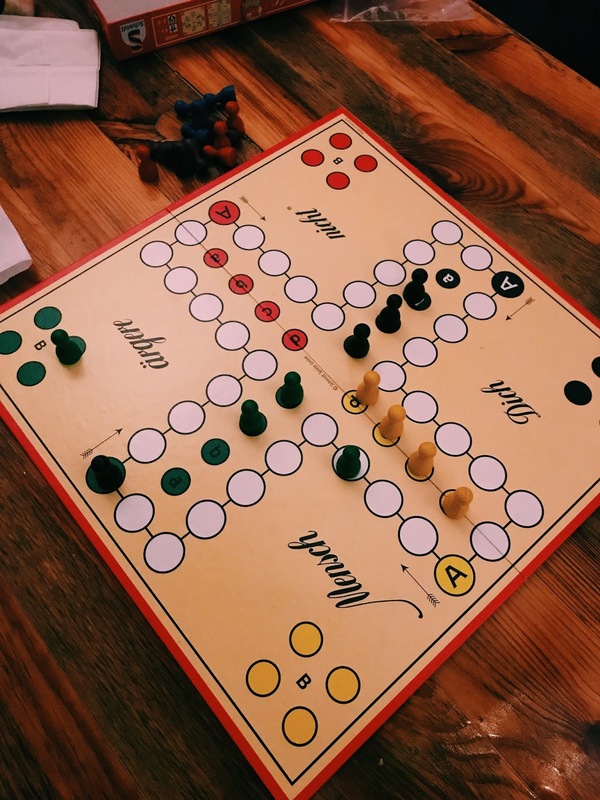 ", & is played similarly to the american board game, sorry. she was ruthless, & would knock your players out in a heartbeat to get ahead, all the while cackling, "mensch ärgere Dich nicht! don't get mad, man!". it is one of my favorite memories, & the entire market just kept reminding me of her & those days we spent playing this hilarious board game. well, what do you know that we would wander into a tent & on a table in the center would be that very game! i literally just screamed, pointing & flailing & jumping up & down. & then susanna realized what was happening, & then joined me in the pointing & screaming & flailing. of course, all to the embarrassment of my husband, kevin, who had no idea what was going on & why his two friends were jumping & screaming & pointing & flailing in a room full of very concerned people. but dude, the chances that this would just be sitting there. my mind was blown. as a whole, we all thoroughly enjoyed it. even though it wasn't totally authentic, it was absolutely worth it just to get a taste of the magic that is a german christmas market. the food, the crafts, the sights & sounds... it was all so lovely. but honestly, at the end of the day, it was a delightful experience purely because it was spent in perfect company. i'm a lucky girl to have such kindred spirits in this life. don't tell santa, but we borrowed his chair while he was away on important gift giving business. i asked sus what she wanted for christmas, & she said a private jet so she could travel the world. she asked me, & i said a cozy little house where we could all live together. like i said, polar opposites. gotta love her though. Wow! You remembered all the tiny moments that made this excursion special and captured the quintessence of this truly lovely afternoon! 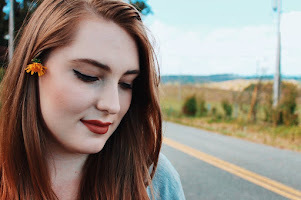 You have a knack for this blogging stuff! Hooray!